Here's a Bible lesson you can use with your students to help them understand that God takes care of us just as a gardener takes care of his garden and Christians grow spiritually when they read the Bible and stay connected to Jesus. Bring a bowl of raisins, a bowl of grapes, and some napkins. Print out the visuals below and cut them apart. Put a circle of tape on the back of each one and give each visual to a different child. Hold your open Bible on your lap. Explain that this is a true story from the Bible. (Read John 15:1 and 5.) God says that He acts like a gardener. A gardener helps plants grow. God helps us live right and grow as Christians. In Bible times, many people grew grapes. 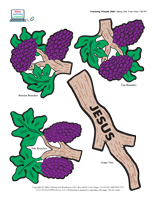 A grape plant has several parts. First, there is the vine. (Have the child who has the Grape Vine place it on the wall.) Whose name is on the vine? (Jesus) The Bible calls Jesus the True Vine. God is the Gardener in the garden of life. Jesus is the Vine who grows good branches. Christians are those branches. If you have asked Jesus to be your Savior, you are like a branch on a vine in God’s garden. What happens to a branch if it is cut off the vine? (It dies; it doesn’t grow anymore.) That’s what happens to anyone who isn’t a true follower of Jesus. The person may look like a Christian, and even act like one (by going to church and doing good things). But, if this person hasn’t invited Jesus into his life, he’s a fake Christian. He may fool other people, but he can’t fool God. This verse is part of the Great Commission, the last command Jesus gave before He went to heaven. Jesus promises to be with us always. Jesus will never leave us, just as a vine never leaves the branches.